The novel is about a man who remembers being seven years old and what happened when his fate found him. He isn’t having a particularly good time, feeling rejected, forgotten, and hides in his books. His childhood isn’t the kind that people feel nostalgic about, and as an adult he does not miss it. But then this lonely child makes a friend. The event that leads to the friendship is tainted with tragedy, but only tainted, because the story is told through a seven-year-old’s perspective and joy can be found in the smallest things even as the world crumbles. Our nameless protagonist moves between what is hard reality and then fuzzy magic-imbued reality and the transitions are seamless and matter-of-fact. And that is all I’m willing to give away about the plot. Not only did Gaiman capture the paradoxical nature of dreaming where you feel things without knowing why, where people look like strangers, but you know they are your friends and family and it doesn’t matter what they look like, where a nightmare is defined by a feeling, being trapped in thoughts of terror, rather than what is actually happening around you… but he also captured the act of awakening. The pain of loss, and the odd sense of excitement and anticipation though there is nothing in your world that would account for these feelings. He addressed perspective, the way you can zoom in and out on an event, and how your feelings about it change. The way truth is negotiable because our minds fill in the blanks. He makes the reader question the real, the possible, and how the two interact. He brings us into the in-between world of mesmerizing possibility. The world we visited much more often when we were children. And he makes us pine for it. For all of these reasons, this is my favorite of Gaiman’s works. I hope that you will give yourself the chance to love it too. P.S. 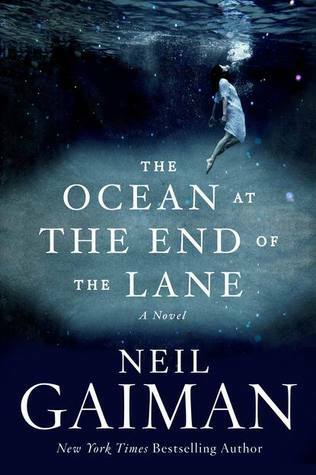 If you are a huge Neil Gaiman fan, there is also the added bonus of the fact that although the family in the novel is not his real family, he did base a lot of the book around his actual childhood. The picture on the back of the cover is of Neil Gaiman’s child-legs.